CLAY ROLLER Pasta Machine: Ideal for FLATTENING and Conditioning POLYMER CLAY and similar materials. Flattened Polymer Clay is great for use in designing unique jewelry, buttons, photo frames, scrapbooking embellishments and much more. Clay Roller Pasta Machine includes 2 rollers, removable crank handle, table clamp & instruction manual. NOTE: This machine DOES NOT include attachments for making pasta shapes. Quality chrome plated steel construction. Use to roll, knead and condition POLYMER MODELING CLAY ONLY. Quick & Easy Assembly. Includes metal clamp. Important: CLEAN ONLY with dry cloth or soft brush. NEVER wash with water or detergent to prevent rust from forming. FOR USE WITH POLYMER CLAY ONLY - DO NOT USE WITH WATER-BASED CLAY. 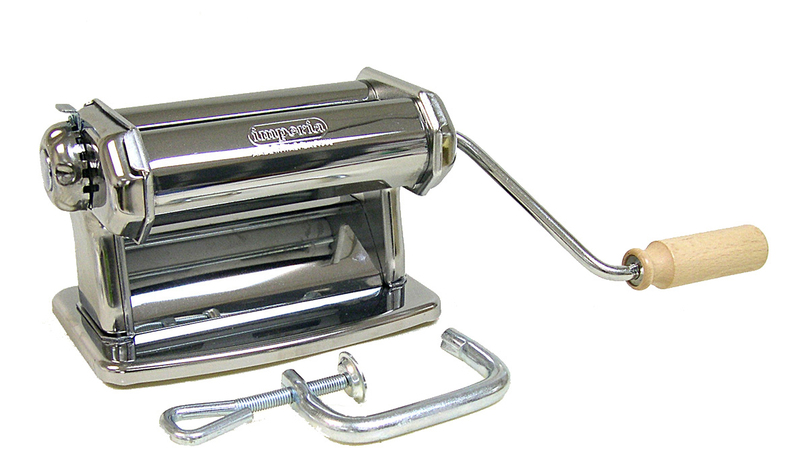 Clay Roller Pasta Machine by Imperia. 7-1/2" wide overall with 5-1/2" wide rollers. Has 6 thickness settings from approximately 1/32" to 1/8".